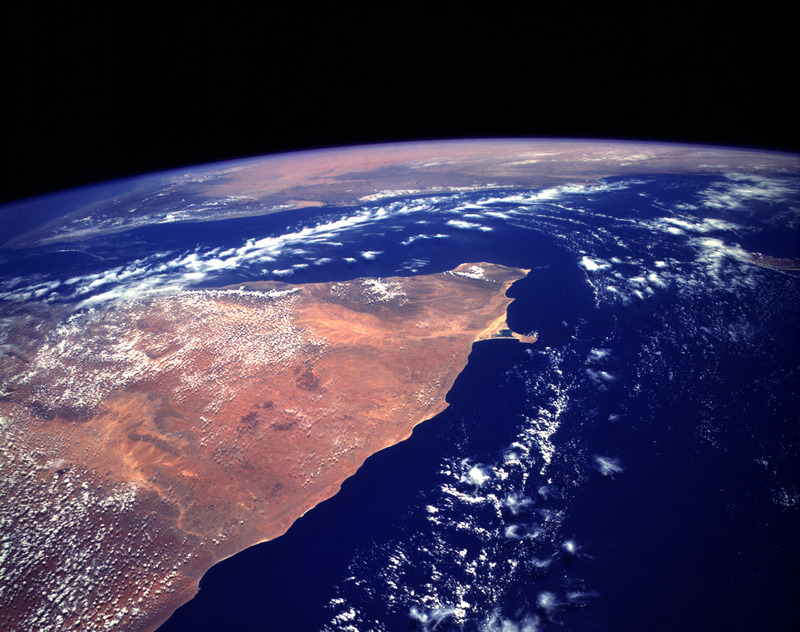 The orange and tan colors of this high-oblique photograph of the Horn of Africa indicate an arid-to-semiarid landscape in the northern half of the east African country of Somalia. Except in the darker areas where thicker vegetation can be found (usually on the elevated areas), most of the vegetation in this part of Somalia is shrub brush and grasslands. Although most of this part of Somalia consists of a low, featureless plateau that tilts gradually southeastward from Ethiopia toward the Indian Ocean, the country does have a series of low, rugged mountains along its northern coast, adjacent to the Gulf of Aden. The general climate of this region features hot temperatures and scarce, irregular rainfall. Two distinct drainage basins are characterized by lighter colors-the Nugaaleed Valley along the western side of the photograph and the other watershed trending toward the Hafun Peninsula, the tombolo along the east coast of Somalia. The southern extent of the Saudi Arabian Peninsula is visible north across the Gulf of Aden.